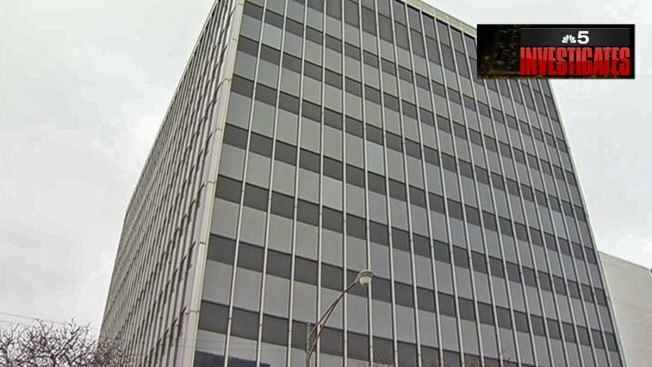 State employees who work at a Chicago north-side office complex said the conditions of their building are making it difficult to serve their clients, including Medicaid recipients and citizens who receive services from the Illinois Department of Human Services. Bedbugs, mice, temperature control issues, inadequate space and plumbing leaks are among the complaints alleged to plague the state-leased building. “It’s just one thing after another with this building,” said employee Sharon Kashkouli, who is also a union member speaking on behalf of other workers. The workers moved into the building at 5050 North Broadway in late 2013 following the closing of two north side DHS facilities in a cost-cutting move by the state. According to a press release, the consolidation of the two offices into the new space is saving state taxpayers about $118,000 a year. The state is leasing 62,000 square feet of the building from Imperial Reality. But some argue any savings are coming at the expense of the workers and clients. The Alliance for Community Services is an organization that advocates for the employees and consumers. Fran Tobin is an organizer who said services have been degraded. A client who visited the office at 5050 N. Broadway said she had an asthma attack shortly after leaving the building. “When you walk through the building, you can almost like feel the dirt around you,” Kathy Powers said. The Illinois Department of Labor issued a sanitation violation to the DHS in October. Also, the Chicago Department of Buildings issued several building code violations last year for wiring issues with the building’s chiller and temperature control issues in the lobby. “We should not be paying landlords to give us substandard space,” Tobin said. Workers also complain there is not enough space to meet with clients. The Illinois Central Management Services negotiated a five year lease with Imperial Reality in 2013. A spokesperson for CMS said it responds to spacing concerns, and that the health and safety of employees and clients is a top priority. “CMS took immediate action when notified of bedbugs and works with the landlord to resolve any issues as quickly as possible,” CMS spokesperson Alka Nayyar wrote in a statement. CMS said a professional pest control company had treated the area months ago with more treatments available if needed. A representative of Imperial Realty said it responds in a timely fashion whenever the state notifies the company of an issue. But the complaints echo others posed by DHS workers in recent years. They’ve protested bedbugs at other DHS offices and complained about possible asbestos during the renovation of the Humboldt Park office in 2012. “They were doing construction in a building where people were coming in with their kids to apply for medical benefits and food stamps while there’s construction dust,” Tobin said. CMS said it takes reports of asbestos exposure very seriously. “Our standard procedure is to respond immediately to reports of this type of concern,” Nayyar wrote. But workers said morale is down and that taxpayers who pay for the leases should take notice.